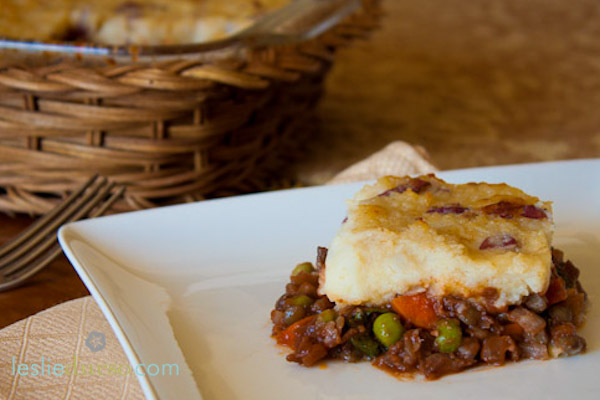 Shepherd’s Pie is one of my favorite hearty meals for the cold months! It takes awhile to make, but it’s so warm and filling, it’s worth every minute! My recipe is packed with lentils and veggies and has a dark rich broth with mushrooms and red wine 🙂 I’m a fan of wine broth with anything and this is no exception! This would make the perfect main dish for Thanksgiving! In a large pot, sauté the carrots, and onions in a few tablespoons of olive oil. After 3 minutes add in the mushrooms and continue to sauté until the mushrooms are soft (about 5 minutes). Sprinkle in the flour and mix well so a roux (paste) has formed. While stirring constantly, add in the wine and broth and mix until the flour has dissolved. Bring to a simmer and add the kale, peas, lentils, soy sauce, tomato paste, garlic, and oregano. Stir and continue to cook lightly simmering about 7-10 minutes or until the mixture reduces to a thick stew-like consistency. Pour into a 9 x 9 baking dish and top with mashed potatoes. Bake for 30-35 minutes, or until the potatoes get a little golden, at 400 degrees. I made this last night and it was a major hit in my house. I prepared everything early and combined and baked and it worked out magnificently. I used Almond flour which I donʻt think had the same thickening quality as other flour, however because I prepared early I added the lentils uncooked and they did a great job of absorbing some liquid to give the stew like consistency required. This is cooking right now in my oven. I want to know how you get this to fit in a 9 X 9 and are able to spread the potatoes on top. I had to put this in a 9 X 13 to avoid spilling everywhere. I followed all directions and even simmered longer trying to get a better stew-like consistency. Because of th larger dish, I was unable to cover the entire top with mashed potatoes and just ended up trying to evenly space. I am looking forward to seeing how this tastes, but would like to know how to get the consistency to make it fit in the right size dish without having to simmer it for an hour.